Because our walls are drywall, you see. Or, at least these are. The rest of the house is mostly plaster on lathe with some sheetrock repairs here and there. But I digress. Week 8 has wrapped and we finally have the beginnings of walls going up! We spent a good amount of time under the house on Saturday prepping the rest of the supply lines for the toilet, sink, and tub. I cut CPVC pipe and insulation to the lengths Todd called out–it was nice to be useful. I also had my phone out, playing music because music makes everything better, only to be punished for that effort when the phone slipped from my hands as we were crawling out from under the house and landed, face down, on the edge of a brick. Casualty count: 1 Droid Maxx phone screen. Damn. 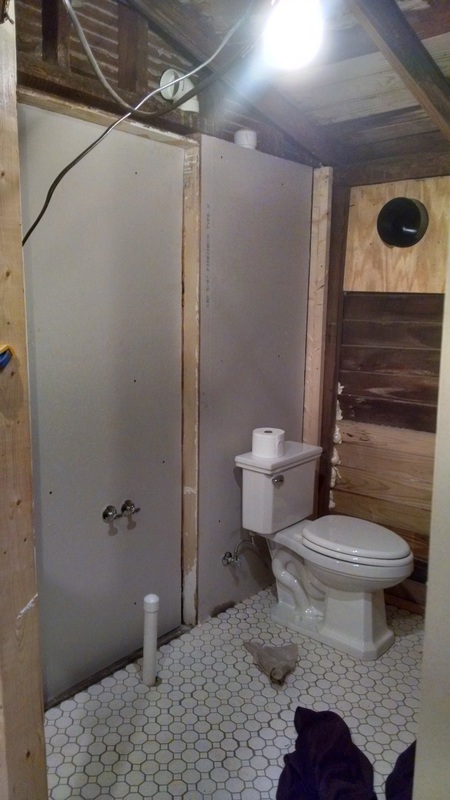 We also trimmed two sheets of drywall that evening for the section of interior wall behind the commode and the doorway opening between the bathroom and my office. After 7 weeks it was suddenly very strange not to be able to talk to Todd through that opening when I was at my desk and he was working in the other room! Still, I’m glad that we’ve got it filled in. Apparently we’re doing the drywall the “wrong” way, but ask me if I care right this second? Todd tells me, after we’ve cut the first few panels, that you’re supposed to use the 4’x8′ panels sideways and stack them so that they run perpindicular to the studs. That last part makes sense for stability and stress and all that, but for the sake of efficiency, if you have a space that’s less that 4’x8′, it makes absolutely no sense to chop a panel into sections and fit them in when one tall piece will work. 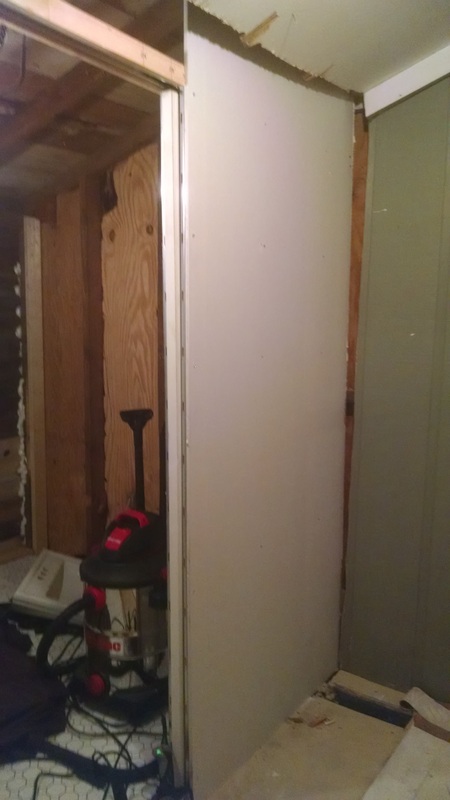 And you’ll see in that first photo that we ignored those instructions, again, when covering the studs for the pocket door and will, probably, continue to do so for the rest of the dividing wall. The skinny strips left over from the first panels will work great for building the new corner of the room. Rules are rules, but loopholes are loopholes. And common sense trumps even that some days. Todd’s last task for the week was to fill in those gaps between the new subfloor and the exterior walls. 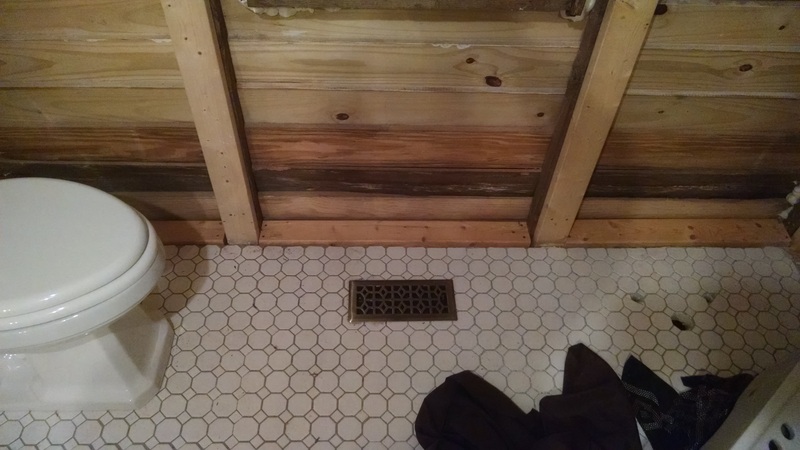 This blocks all those problematic drafts and will keep the insulation that will be added when we do the drywall from sliding down to the ground. The to-do list for this weekend is to get the rest of the dividing wall in place, I’ll add some privacy film to the window, we’ll get the sink mounted on the recessed wall and hooked up, and maybe even get the new outlet and switches wired. But with the party next weekend, I’ll be focusing on getting the rest of the house tidied up, decorating the dining room for our luau theme, and starting the food prep!